This has to be one of the questions I get the most, even from people living in San Sebastián. Where can I go for pintxos on Monday night in the Old Part? So, to celebrate the end of the summer, that glorious time when everything is open and kitchens seem to want nothing more than to feed you, I am answering it here. Because Monday can be a difficult night to do pintxos in San Sebastián. Of course, if you are willing to explore non Old-Part options it becomes easier, but most visitors want to see the famous spots before getting off the beaten path.. And, let's admit it. 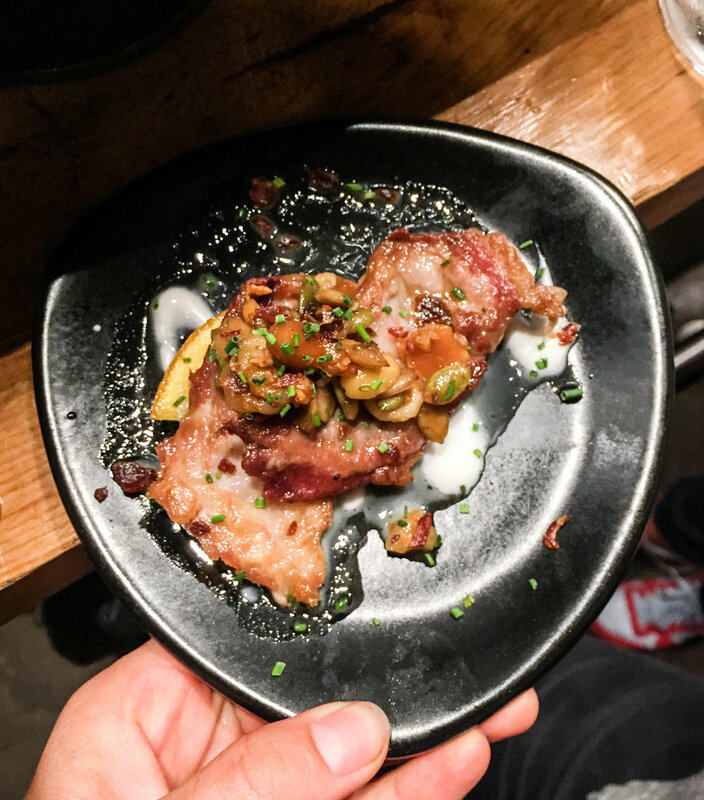 You accidentally left Monday night open for pintxos since there were no Michelin options, but you didn't realize that your one night to experience all that the famous blocks of San Sebastián's pintxo quarters would be when the best ones are closed. Don't worry! There are still just enough of the best ones open to make a great route. Follow the one I've mapped out below, in order, and prepare for a night of deliciousness. My favorite way to start any night of pintxos is with a traditional bite. Paco Bueno is a family bar famous for their tempura-fried shrimp. The truth is, these bites are fine but they wouldn't taste half as good if it weren't for the feeling of soaking up history from the bar's photo- and poster-lined walls. So grab a bite and move on. Before you go too far down the road of wine, let's take a break at one of the Old Part's more modern bars, Sirimiri. It's cocktail time. The bar here is excellent, and though this will probably be one of your highest bills all night (an astronomical €20 compared to €4 at Paco Bueno, for example), it's worth it. Get the cocktail that contains your favorite liquor and order either the octopus (pulpo) or the piece of Iberian pork (pictured at the top of the post). Both of these dishes had me licking my plate, no small feat. Casa Urola is one of the top spots in the Old Part. The chef, Pablo Loureiro, cares. He just cares about sourcing the best produce, taking exquisite care of it, and he really knows how not to overcook vegetables. For those who want some protein, the scallop is a modern classic of the old part: served with cold ajoblanco (almond-garlic) soup and a coffee vinaigrette, it's so imaginative but, more importantly, it just works. Gandarias is another classic in the old part. If pintxos were a baseball game, Gandarias would be the pinch hitter. It's got one thing it does quite well (the steak pintxo with peppers) and it is open later than almost any reputable pintxo bar in the Old Part. When everything is closed or your pintxo tour is running overtime, you can count on Gandarias as a last stop. The risotto is a good option for vegetarians, and the list of brochetas are standout as well. Even better, the pintxos here tend to be a bit more filling, good for a last stop. Don't veer too far from the recommendations, though...this place can be hit or miss. If you make it to Atari before 11.30, do take advantage of one of the only dessert pintxo menus in town. Make sure to try the cheese ice cream and the torrija. But, truth be told, the main reason to finish here is the nightcap. Atari has long been the city's spot par excellence for a first round of gin-tonics, which they prepare with care and flair. Tastes so good after a night of stuffing yourself. Don't worry—after the first one your tummy will be well settled and ready for more. And, there you go! Everyone's Monday problemz solved. Do me a favor, if you do the tour drop me a line and let me know how you enjoyed it!